SelectMDx Liquid Biopsy has been added to the most recent 2018 update of the Guidelines of the European Association of Urology, in the diagnostic workup of the men being considered for prostate biopsy. 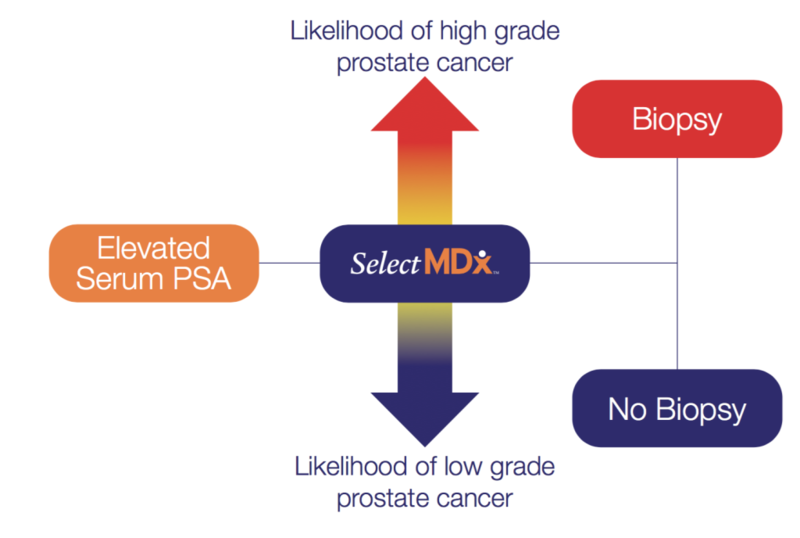 If you are being considered for your primary or secondary prostate biopsy due to an elevated PSA test result you might want to consider the SelectMDx Liquid Biopsy – a noninvasive diagnostic laboratory test performed on a urine sample which measures the likelihood of discovering prostate cancer during a prostate biopsy procedure. The test measures mRNA levels of DLX1 and HOXC6 (genetic biomarkers over expressed in Patients with prostate cancer). The test has been thoroughly evaluated during clinical trials*. SelectMDx Liquid Biopsy allows the Patient and their physician to undertake an informed decision regarding the necessity of performing primary or secondary prostate biopsy. Thus the test potentially enables the Patient to avoid any further, unnecessary, invasive diagnostic procedures and their potential complications (approx. 18% of Patients after prostate biopsy experience complications and up to 3% might require hospitalization as a result of this procedure). HIFU CLINIC Prostate Cancer Center is the first clinic in Poland and one of the first clinics in Europe to offer this breakthrough test for its Patients. What is the SelectMDx™ Liquid Biopsy Test? The test can also detect aggressive prostate cancer which should be treated in early stages to ensure the best long-term clinical outcome for the Patient. What is the purpose of the SelectMDx™ Liquid Biopsy Test? A liquid biopsy test result clearly presents the % risk of discovering prostate cancer during a prostate biopsy procedure. The test also distinguishes between low-grade and aggressive prostate cancer. Based on the test result the Patient and their referring physician can decide whether any further diagnostic tests need to be performed (i.e. prostate multiparametric MRI or prostate biopsy). Who should consider having the SelectMDx™ Liquid Biopsy Test? SelectMDx Liquid Biopsy is a test dedicated to men with elevated PSA levels interested in prostate cancer prevention. The test determines the risk of discovering aggressive prostate cancer during a prostate biopsy and thus enables the Patient to make an informed decision regarding the necessity of having to undergo this procedure. Please contact HIFU CLINIC Prostate Cancer Center’s Medical Team via our free preliminary online consultation, to determine whether you are a suitable candidate for the SelectMDx Liquid Biopsy test. How can I arrange a test? To arrange the appointment, please contact the Patient coordination department: Marcin Zyskowski +48 606 994 372 or by email: contact@hifuclinic.eu. The aim of this procedure is to restore man's ability to develop erection, e.g., after radical prostatectomy.